Get instant volume and style with these Superior Quality, 100% Remy Human Russian Hair extensions. This beautiful hair is long lasting, luxurious, soft and silky smooth. 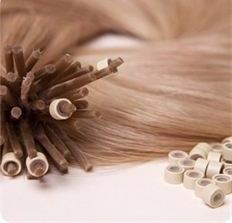 Russian hair is one of our best selling hair extensions, thick, luxurious and lasting for up to 2 years and longer. Naturally Silky Soft, Strong, Luxurious And Blends Seamlessly With Natural Hair. ONCE YOU HAVE TRIED RUSSIAN HAIR, YOU WILL NEVER GO BACK. These beautiful, Russian Hair Extensions are superior in quality, DOUBLE DRAWN, soft and luxurious. We are proud to say that our Russian Hair Extensions have not been chemically processed like so many other types of cheaper hair. We can assure you we know our products and take pride in supplying only the most purest quality hair available. Silky soft, pure virgin, these Russian hair extensions are extremely popular due to their rarity and extreme high quality. This double drawn hair is true, 100% supreme Remy Russian hair. You no longer need to be frustrated and disappointed with hair suppliers and hair artists selling you bad quality hair. This premium double drawn Russian hair is tangle FREE, soft, silky smooth and has not been acid processed. The true fact is Russian Hair is always better quality and this is why it is more expensive. This is also why the results are fair and this hair will last longer. Our Double Drawn Russian Hair Extensions can be coloured and always remains soft and silky smooth. We take pride in giving our clients only the best. We offer the finest quality, soft and silky Slavic Russian Remy Hair Extensions. This hair is extremely rare and in high demand among hair salons. It’s one of the most expensive hair we offer because its not only rare but of absolute, supreme quality. The hair used is True, 100% Premium Russian Remy Hair. With proper care and maintenance Russian Hair will last you for at least 2 years.